Where can I register a boat? The Fish & Wildlife Office in Augusta is the central office for boat registrations and registration records. Many Maine municipal tax collectors or town clerks are Recreational Vehicle Agents for the Fish & Wildlife Department. Boat registrations may now be renewed online if your town is part of the program. This online service allows you to register your Boat (vessel) with the State of Maine. Following your transaction, you will receive a confirmation page to print for immediate use. Your official registration and stickers will arrive at the shipping address specified within thirty days. If you are registering a watercraft at the Augusta Office or in a town other than your town of legal residence, you must first pay your excise tax in your town of residence. Be sure you have a receipt that shows the annual excise tax has been paid on your watercraft or your watercraft cannot be registered at another location. Motorboats used exclusively for racing purposes and displaying a valid boat number issued by a recognized racing association. Agents may charge a fee of $1.00 for renewals and duplicates, and $2.00 for new registrations, rollovers, or transfers. Boat excise tax must be paid by a resident to the tax collector of their town before registration. 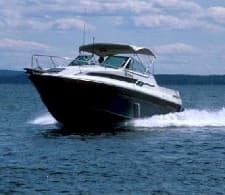 A nonresident, prior to registering a motorboat which is located in Maine more than 75 days during a calendar year, must pay an excise tax to the Maine town where the boat is principally moored, docked or located. If the boat is exempt from tax, a tax exemption form must be completed by the owner and submitted with registration application and registration fee. Proof of payment of sales tax is required for new registrations (resident and nonresident). Registrations may be obtained from licensing agents or by mail. For applications and agent information please call (207) 287-8000. Watercraft registrations are issued for a specific calendar year and are valid through December 31st of the year issued. Lake and River Protection Sticker required.